Drunk driving laws in California are harsh. Even a first offense can have serious consequences. Drivers over 21 years old who have a .08 percent or greater blood alcohol content (BAC) may be charged with misdemeanor DUI. First offenders, if convicted, face fines between $390 and $1,000, plus penalty assessments, a maximum of 180 days in jail, a drivers’ license suspension of up to six months, a $125 license reissue fee, and mandatory alcohol program attendance. If there is a second offense within 10 years, the minimum jail time can be 365 days in jail, a driver’s license suspension of up to one year, the fines increase to between $390 and $1,000, plus penalty assessments, the mandatory alcohol program attendance is for 18 to 30 months, and you are required to use an ignition interlock device (IID). If you cause an injury, you can be charged with a felony. If you have been charged with DUI, you need legal help. 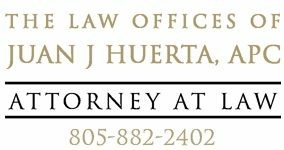 Juan Huerta has the experience and ability to aggressively protect your rights. Don’t hesitate, let us help. Throughout our criminal defense practice, we represent clients in Santa Barbara, Santa Maria, San Luis Obispo, Ventura and all the communities in between. If you need legal assistance, don’t wait. Please use the form on this page or contact us by phone today. © Copyright The Law Offices of Juan J. Huerta, APC | All Rights Reserved | Powered by Synergy Computing, Inc.